Many individuals whom lead a healthy lifestyle through exercise and a sensible eating plan will find that there are still areas on their body where they can’t shift excess fat. For these individuals liposuction could be the answer to remove the stubborn fat cells. Liposuction can be used to sculpt your body to achieve results you never thought were possible. The procedure is performed under local or general anaesthetic, tiny incisions are made and the fat is broken up beneath the skin, the fat is then syringed or vacuumed out. 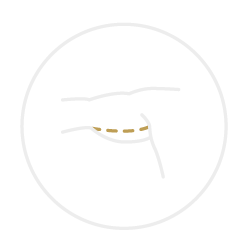 Popular areas for fat removal are thighs, hips, abdomen, knees and buttocks. Q: Will I have bad scarring after the procedure? The scarring is minimal, small areas will scar from the incisions. Q: How long will the recovery procedure take? Normally around 3-4 weeks, you will also use support bandages during the recovery procedure. Q: Do I have to have a certain amount of fat for this procedure? Yes, your surgeon will assess you at your consultation. Yes if you maintain a healthy diet and exercise programme after your surgery.